Checklist: Are your legacy apps due for decommissioning? Every organization has legacy applications, but did you know about the risks associated with many of these apps that could have major consequences for your organization? You may need to decommission some of your unused legacy apps if they are causing security or failure risks to your system. 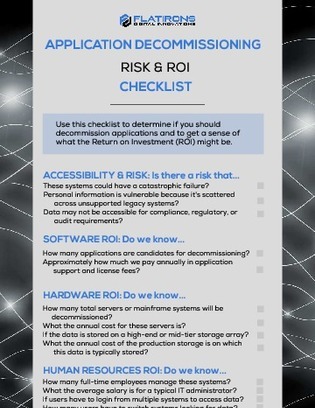 Take a look at this checklist to find out if your legacy apps are at risk of causing failure in your organization, and learn how you can go about getting started on an application decommissioning project.